A friend of mine recently came back into town suggested we go to Atomic for some real Greek food. It’s been a while for me – the last time was at Jardin de Panos a couple of years ago. I get a little Kojax here and there but to compare it with these restaurants would be unfair on both ends. Of course, I accepted. Who doesn’t like trying new restaurants and new foods? We trekked out to Chomedy, got a little lost along the way but made it in twenty minutes or so. Making Laval a final destination always causes me to hesitate a little – it’s unchartered territory, at least for me. But I’ll be totally honest and say that it wasn’t so bad. The treasure trove of ethnic restaurants (ex: Karoun) that you find in the area are exciting enough to outweigh the amount of time it takes to get there. Parking in the strip mall car lot, Atomic is a definite a stand out with its bright red signage contrasting with its deep blue four seasons ‘garden terrace’. We went on a weekday for a late lunch – it was pretty quiet with only a few regulars occupying a scattered number of seats. It’s clear that there’s a lot of emotion and pride that goes into making the food here as evidenced by our experience and the video below. As a family run restaurant open since 1994, Atomic seems to really care about the products they serve, making it their utmost priority to provide quality ingredients to make a quality dish for their customers. It showed. My friend had been to the restaurant several times before, so she took the reins in ordering some of her favorite dishes. 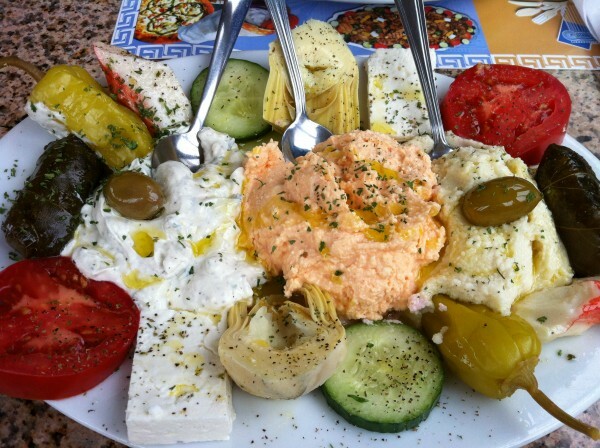 We got a starter dish of cold pikilio which was a trio of dips: the classic yogurt and cucumber tsatziki, the kompanisti which is made of roasted red pepper and feta as well as a skordalia, tasting heavily of garlic. Encircling the outer edges of the plate were hot peppers, artichokes, cucumbers, feta, tomatoes and olives. For me, my favorite had to be the kompanisti – the red peppers and the feta mixed together gave the dip a sweet, salty and tangy flavor all at once. Hard to accurately describe but it was delicious, especially paired with the warm pita that accompanied the dish. Next came the saganaki – my first time having this dish. 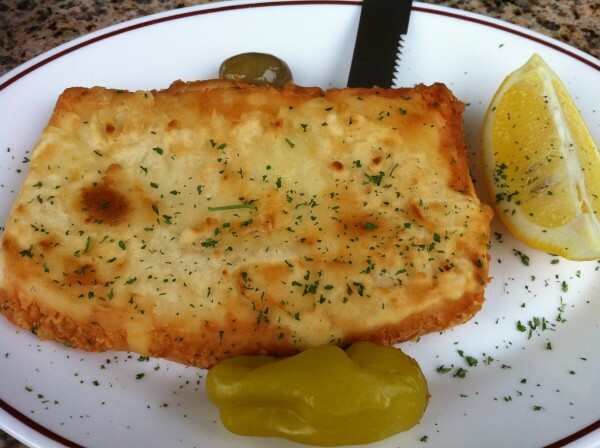 It’s one heavenly slice of fried Greek cheese. Drizzled with some fresh lemon… you’re good to go. Crispy on the outside and spongy on the inside, I have to say that I personally like the dish – I ate just under half but any more than that would have been too much. I would share it with more than two people. My friend on the other hand said that she could eat the saganaki all day, all night all year. Okay, so maybe that’s an exaggeration but you get the idea. Fried artichoke hearts came next – again, a touch of lemon is absolutely necessary. 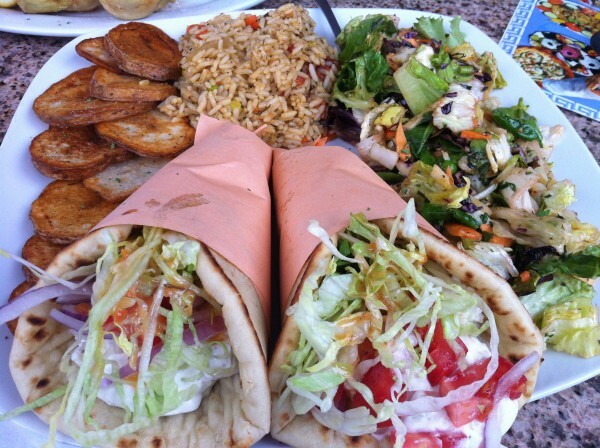 A large plate of two doner came to our table accompanied with some rice and salad. We mistakenly thought there would be beef or chicken or pork in the pitas but to our surprise, it was meat-free stuffed instead with lettuce, tomatoes, onions, large chunks of feta all coated with tsatziki. Needless to say, the rice and salad were our last priority. They ended up going virtually untouched – we had so much other food that we had to eat. That being said, we couldn’t resist dessert. 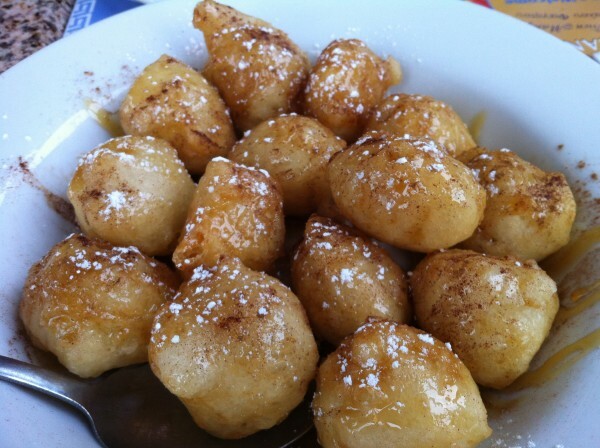 Greek honey balls, on the suggestion of our helpful server. Soaked in a thick honey sauce, these balls were soft and easy to cut into while hot. As we chatted and the balls cooled closer to something like room temperature, they hardened slightly. No big deal. They were pretty much all devoured anyway. As you can see from the photos, the portions are very generous. Atomic does not skimp on the quantity of the food being served. We ate pretty much everything – when we left, I think we both had trouble breathing. So. Much. (Good) Food. Tags: Artichoke Hearts, Atomic, Cheese, Cucumber, Dinner, Dip, Doner, Feta, forkandtell, Greek, Gyro, Honey Balls, Local, Lunch, Montreal, Olives, Onion, Pita, Red Pepper, Saganaki, Tomatoes, Tsatziki, Yogurt.